Yesterday, September 17, the English language service of Al-Jazeera TV came with an article on new guidelines for jihad given by Ayman al-Zawahiri, the actual leader of Al-Qaeda organization. That article can be downloaded from the above link as a PDF file (about 200 kB). It reveals the new strategy of al-Zawahiri's organization and is dedicated to his followers on the anniversary of September 11. Syria ... Mutual killing continues in the community of Al-Azaaz, and Al-Qaeda is to blame for the confrontation. Armed extremists attacked [the town of] Al-Azaaz from a distance of five kilometer from the Syrian-Turkish border, killed at least five [members] of the "Free Army" and took about 100 persons hostage. 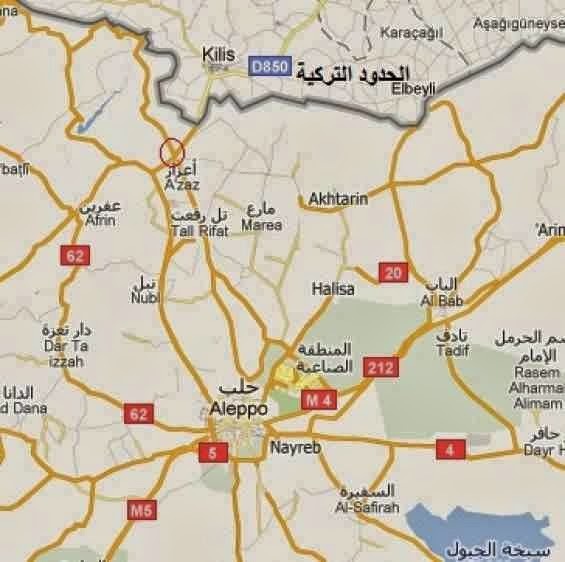 Fierce battles between armed groups in the Syrian [town of] Al-Azaz. Al-Qaeda tracing [a demarcation line] in the strategic [important] community of Al-Azaaz after cruel [behaviour] against the Free Army. According to CNN (September 20) the attacking force of Al-Azaaz should belong to an Al-Qaeda related organization named the "Islamic State of Iraq and Syria" (ISIS). On September 23 / 24, CNN published the following justification given by ISS for their driving out of moderate rebel fighters from the border town of Al-Azaaz. First time, by the way, I encountered the expression "pro-democracy traitors". sending international and U.S. help to Syrian victims of war. 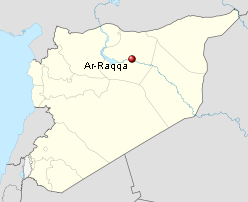 While one Al-Qaeda group is fiercely fighting in the Aleppo region against their former allies from the "Free Syrian Army" (FSA), a quite different development can be observed in neighboring Ar-Raqqah province. In Ar-Raqqah another Al-Qaeda related organization, the "Al-Nusra Front", has come into the focus of news media. As the English language channel of Al-Jazeera reported on September 21, a "Free Syrian Army" (FSA) brigade with hundreds of fighters had joined the Al-Nusra Front in a move considered as a huge blow to moderate rebel forces. Headline: "Shin Bet" [predicts] an integration of Palestinians into Al-Qaeda. Ghaza - An intelligence report from Israel's [home security agency] Shin Bet is warning of the recruitment of 48 Palestinians from the [region] for Al-Qaeda in Syria. It is therefore possible that they might use the knowlege they had obtained opposing Israel, according to what the report is indicating. The [Israeli] journal Yedioth Ahronoth reminded of another danger which is being imposed by their cooperation and which appears in secret intelligence reports [on the Israeli side] about elements of global jihad. The investigator launches a study on the [identification] of tendencies [within] groups and armed units in Syria. Abu Ramaan: "Al-Qaeda" is the strongest unit in Syria. Dr. Mohammad Abu Ramaan, special investigator for matters [concerning] Islamic communities, considered "Al-Qaeda organization" as the strongest armed unit on the Syrian [battle]field for the moment. Armed [elements of] Al-Qaeda could blow up [an artificial] barrier of [river] Euphrat and [Sid] Al-Baeth (*). (*) Sid Al-Baeth is an artificial barrier of river Euphrat at Ar-Raqqah township in the Syrian district of Ar-Raqqah سد البعث في محافظة الرقة which is bordering Turkey. Damage to the barrier itself or the river control system of a neighboring tributary could result in extensive flooding of the area. The director of the bureau of information at "the organization for the national coordination of powers for a democratic change in Syria" disclosed that the opposition warned [residential employees] to receive instructions [about notifying on existing elements from] the "Islamic Nation of Iraq and Syria" (Daaesch) and the "Al-Nusra front", [all those] related to "Al-Qaeda" and preparing the detonation of an [artificial] Euphrat barrier and [that of] Al-Baeth on river Euphrat near the town of Ar-Raqqah in Northern Syria. Al-Qaeda going to [or: willing to] reverse control of unmanned aircraft. Since 2010, there is indeed some swift and violent development of anti-drone war technique [applied] by anti-American forces. In the same year , Turkish authorities arrested a member of Al-Qaeda organization. 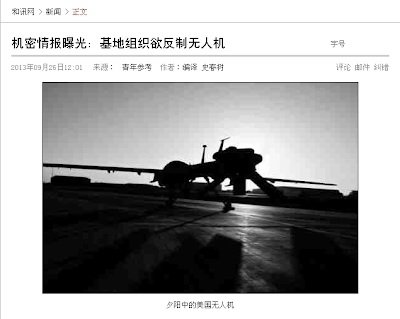 That 23 year old high-school student, specialized in mathematics, was assigned to some kind of mission [which consisted in] finding out a way to analyze the pattern of attack of unmanned aircraft. In January 2011 and in the Northern Waziristan region of Pakistan which is a "focal point" for observation by unmanned aircraft, the U.S. national defence intelligence office detected an unusual electronic signal. They considered this [signal] to be related to a " discovery of terrorists by head measuring [using] a GPS interference capacity measuring test ". This [signal], however, could not arise from some military used GPS frequency or some [linked pathway] for secret communications that would impose any threat. [According to] all sorts of indications observed, a transmission of unclear signals can seemingly be taken into consideration. It only needs interference with some [surface] GPS receiver to be able to influence the ability of an unmanned aircraft [that is] aiming at a fixed target. The U.S. army intelligence department discovered as well that terrorists are exploiting laser detectors whenever unmanned aircraft intend to launch laser guided missiles. The national defence intelligence office immediately came to the following conclusion: " The group for technical [studies and development] subordinate to Al-Qaeda organization still lacks success in conformity and deployment when it comes to the technical know-how of hitting the unmanned aircraft system. " However, [if] engineers devoted to [the matter of] the terrorists once " overcame the significant challenges of planning, that [weapon] system could probably create huge damage to U.S. activities in Afghanistan and Pakistan. " An official al-Qaeda website that is restricted to members of the terrorist group opened its first Twitter account this week in what U.S. officials say is an effort to resolve a major split over Syria’s Islamist rebels. The Shamukh al-Islam website, used as an official clearing house for al-Qaeda members to communicate and issue propaganda statements, started its first Twitter account on Tuesday. The first posts on the account focused on divisions between two al-Qaeda rebel groups in Syria, al-Nusra Front and the Islamic State of Iraq and the Levant (ISIL). Washington Times: Al-Qaeda creates its first Twitter account. On the account there have been published 29 tweets attracting 1532 followers as of Friday noon. The above visitor from Pakistan seems to have used an unspecific national internet access point and can therefore be regarded as "not fully localized". His/her IP No. could then be of only limited use when it comes to undertake an identification of his/her position. 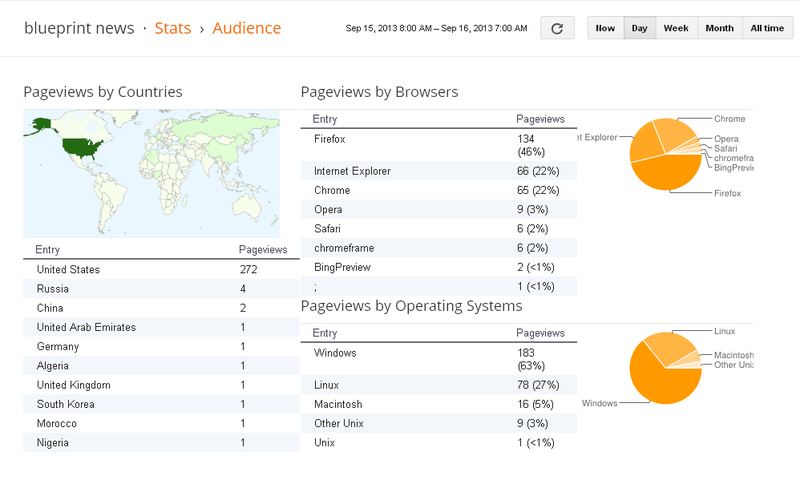 In fact, the above used IP address has a report of being inactive during the last nine weeks and is marked as "toxic". A rather cryptic ISP is obviously referring to some Pakistani internet provider and who is operating similar IPs. Furthermore, the Nokia handy used doesn't belong to the latest generation. 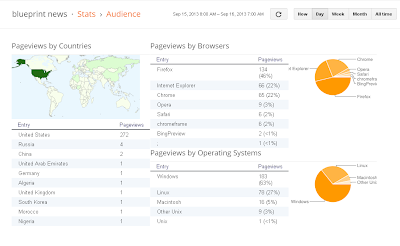 There's only one other visitor to "blueprint news" who is using such kind of device for sporadic visits from Nigeria. However, the Pakistani visitor has offered us an interesting view on his country and neighbouring Afghanistan. It is showing all those places that are related to the Taliban and Al-Qaeda: Kabul, Kandahar in Afghanistan, the tribal area of Quetta, as well as Jalalabad and even Abottabad. 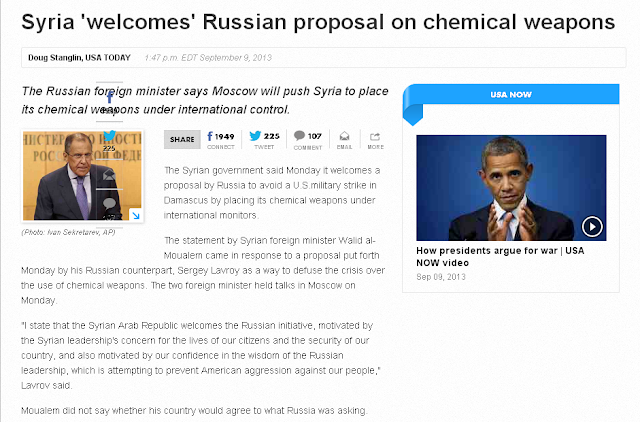 Repercussions of the Russian - U.S. agreement on a destruction of Syria's chemical weapons. The Arabic language source is quoting comments on the agreement by Western politicians like British foreign minister Haig, French foreign minister Fabius and NATO secretary general Rasmussen. Syria's opposition doesn't recognize the Russian - U.S. agreement on the item of Syria's chemical weapons. News from Russia's news agency [i.e. Novosti] are saying the chairman of the supreme military council of the Free Syrian Army, Idriss, issued [the following] statement the day before: "We (the Syrian opposition) don't recognize the Russian proposal (the proposal regarding the item of chemical weapons)". Iraq welcomes the Russian initiative to [take over] Syria's chemical weapons [in order to safeguard them] from being hitten. On Wednesday [i.e. September 11], the government of Iraq welcomed the Russian initiative to ensure the disarmament of Syria [as far as it concerns its] chemical weapons and to put [these weapons] under [international] control to avoid a military strike [from] America. Some days earlier on September 8, Shafaaq News quoted an interview with Iraq's minister of foreign affairs Hoshyar Zebari (photo above). The Iraqi minister of foreign affairs Hoshyar Zebari denied that any Arab country or even the Arab League have supported the US strike on Syria during the Arab Ministerial meeting which was held in the head quarters of the League a few days ago in Cairo. *It seems to many that the US is seriously preparing for a military strike designed to cripple the Assad regime’s military capabilities. Do you agree? -True, American preparations are serious, and the strike seems certain. In my estimation the American administration will not stay silent. *Do you think it possible that the US will not do anything, even after moving warships into the Mediterranean? Of course no. This is a very difficult matter. As I mentioned, an American military strike is a near certainty. This issue is connected to politics, domestic concerns, the position of President Obama, the American leadership, and their pride. The American administration has reached a point where it cannot back down and the consequences of the strike will be extremely dangerous for the entire region. *What are the possible repercussions of a strike on Syria in Iraq? -Iraq will be directly affected by the continuation of the Syrian crisis and its extension into Iraq. The Islamic State of Iraq and the Levant has become a single front containing terrorist organizations including Al-Qaeda, Al-Nusra Front, and others. Their only goal is to cause as much destruction as possible. From a humanitarian perspective, there is also the issue of the influx of Syrian refugees. For instance, over a short period of time Iraq has taken in nearly 43,000 Syrian refugees. Naturally there are concerns, especially since we do not know what the grand strategy is to ensure stability in Syria. No one in the Arab foreign ministers’ meeting had any better alternative for dealing with the crisis except enacting the Geneva II conference and securing peace through the participation of both parties. *Hasn’t the Syrian regime refused to participate in Geneva II? -They did not really refuse it. 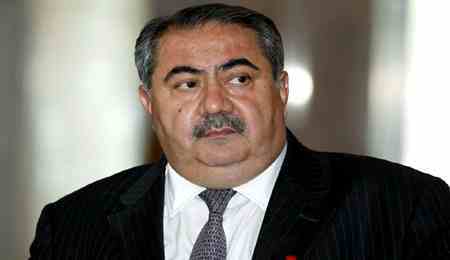 The Syrian regime expressed their consent during a visit to Iraq by Syria’s Foreign Minister Walid Al-Muallem. * But Muallem came out later to announce that Syria’s participation was contingent about certain conditions, including Assad remaining in power until the end of his term in office in 2014. -No. The Syrian regime agreed without preconditions. The two parties must participate in the conference without preconditions in order to ensure credibility. *How do you interpret the Russian and American positions? The former thinks it has proof that the opposition used chemical weapons and America says that it has proof that the regime used them. -These positions are the result of politicizing intelligence information. -Every country is using the information it has to support its own position. Many international parties have had reservations and even questioned the credibility of this information. This debate is ongoing and the UN inspectors will present their report to the UN Secretary General. However the team will not name which side used chemical weapons, only whether or not chemical weapons were used. This means that we will continue to hear debates around who was responsible for the attack. Therefore, it is up the different nations’ intelligence services to assess who used chemical weapons. It is for this reason that I believe that a military strike is coming. *After the military strike, will it be possible for both sides to go to the Geneva II conference and reach a political solution? -Every party should be pressured to arrive at a political solution, but will that actually happen? We don’t know. Will there be greater repercussions or other parties that will widen the scope of the conflict beyond Syria? That is certainly a possibility. *Do you think it is possible that the Syria conflict will spillover into Lebanon, for instance? -With the confrontation with Israel, Hezbollah entering the fray, and terrorist activities here and there, there is serious anxiety over this issue. We, as neighbors of Syria, certainly need to take precautions and work hard with others to settle the differences that could disrupt a political settlement. *Do you mean that if a strike occurred in Syria, however limited, it must come with a guarantee to preserve the state of Syrian through Geneva II? -Of course our goal is protecting the Syrian people and their nation. *What about the current security situation in Iraq? -The security situation is not stable because of continued terrorist attacks. A big part of that can be traced to the performance of security and governmental agencies in addressing the issue. It is also partially a reflection of the Syrian crisis. We have an interest in ending this crisis and finding a secure and safe way out of it, particularly as we are among the nations that are most affected by what happens in Syria. Regarding the current political situation, all matters are on hold and political issues have not been settled. We are awaiting next year’s general elections. *What can you tell us about the preparations for the UN meetings with the Arab Group in New York this month? -As for Iraq, we will go to New York. We have gotten rid of all of the UN restrictions and sanctions that have shackled Iraq, particularly Chapter VII. Having returned to the Arab, Islamic, and international stage, we will go this time free from all the sanctions that we once faced. In my opinion, the most important issue on the table is definitely the Syrian crisis, also the Iranian nuclear issue and the participation of the new Iranian president who will be a star of the meeting in New York. *Has Iranian policy changed following Hassan Rouhani’s election? -There are strong indicators that there is an inclination towards change and dealing with the realities of the situation with little concern for ideology. *Will the Iranian grip on Iraq loosen as well? -They do not have a grip on us, but there are relations and communication. Next week, the Iranian foreign minister will undertake his first visit to Baghdad. *What will be discussed during the Iranian foreign minister’s visit to Baghdad? -A number of issues will be discussed: bilateral relations, the Syrian crisis, and the nuclear issue. *In the case of an American military strike on Syria, do you expect Iran to become a party in the equation? -In my opinion, all nations will remain neutral. Breaking News: Obama accepts Russian plan of a chemical weapons' control by international monitors as Syria's government declares its will to cooperate, even to halt poison gas production. However, it remains unclear whether such plan is realistic in the frame of fierce fighting in Syria's civil war. In my last blogspot, some days ago, I dealt with the crisis in Syria. On this occasion, I presented some visitors to "blueprint news" interested in the Syrian subject and who came from most exotic places all over the world. The following photos of victims from the reported gas attacks in Syria had to be added as they are taken from video material shown to members of the U.S. Congress in the effort to convince them of military action against Syria. This came about the same time when questions of congressmen were answered by foreign secretary John Kerry, defense secretary Chuck Hagel and General Dempsey on September 4. President Obama was absent on that meeting because of his participation on the G-20 economic summit in St. Petersburg, Russia. While official support of U.S. Senate and House on Capitol Hill is still uncertain, Barack Obama is trying to activate his European allies for support of a rather unilateral action in the frame of blocked decisions in the UN Security Council. War with Russia is considered to be unlikely by the Obama administration, even though Russia blocked the UN Security Council and declared that chemical weapons might have been used by Syrian rebels. In addition, Russia sent warships for observation into the Mediterranean where a fleet of U.S. and British warships has already been deployed. Kerry: We are acting cautiously. We are not getting into Syria's civil war. Kerry: Russia won't go to war over Syria. Dempsey: There's a risk of escalation if we do nothing. Kerry: Strike will impact Iran's thinking. A delegation from Syria's internal opposition group is going to visit China these days. On today's regular press conference of China's foreign ministry, the ministry's spokesman Hong Lei said that a delegation from Syria's internal opposition group "Coalition for a Nationwide Dialogue" was going to visit China these days at the invitation of the Chinese People's Institute of Foreign Affairs. The Syrian delegation comprises six members. During their visit, the delegation will be received by leading officials of the foreign ministry and related ministries for an exchange of views on the Syrian situation. "... President Barack Obama has agreed to discuss Russia's proposal that Syria hand over chemical weapons, the White House said Tuesday after Damascus confirmed it would accept such a deal. Talks will begin at the United Nations later Tuesday, a White House official told NBC News, even as Obama prepares to address Congress -- and the American people -- to make the case for authorization to use military strikes if diplomatic solutions fail. British Prime Minister David Cameron said the U.S., France and Britain would propose a U.N. Security Council resolution shortly. Earlier, Syria Foreign Minister Walid al-Moualem told NBC News in Moscow that he hoped acceptance of the "peaceful solution" would "put an end to the war." The building momentum behind Russia's plan, which had already been endorsed by China and Iran, came only 24 hours after Secretary of State John Kerry raised a weapons handover at a news conference in London. Obama said Monday that the Russia plan offered a potential path that averted U.S. military strikes, but Kerry cautioned that the only reason the Russia solution has "potential legs at all" is because of a credible threat of force. Secretary of Defense Chuck Hagel echoed that line, saying the Russia deal "could be a real solution to this crisis," but added: "We must be clear-eyed and ensure it is not a stalling tactic by Syria and its Russian patrons." Senior senators - including John McCain, R-Ariz., and Chuck Schumer, D-N.Y. - announced they were working on a new plan that would authorize the president to use force only if Syria did not comply with a U.N. resolution to remove chemical weapons by a pre-determined deadline. Senate Minority Leader Mitch McConnell announces Tuesday that he will not be voting in favor of a resolution to use U.S. military force in Syria. But even as they discussed their move, Senate Republican leader Mitch McConnell announced his opposition to military strikes against Syria. And Sen. Edward Markey, D-Mass., a member of the Foreign Relations Committee and Kerry's successor in the Senate, said he would not support the use of force resolution passed by the committee, calling it too broad. The president traveled to Capitol Hill shortly after noon Tuesday to meet with the Senate Democratic Caucus and Senate Republican Conference before delivering an address to the nation from the East Room of the White House at 9:01 p.m. ET. Kerry said that despite a Senate delay on a vote after the Russians made their proposal, "nothing has changed" on the administration request for congressional action, though he said the president may talk to congressional leaders about timing of a vote. In a further development, a spokesman for Vladimir Putin said the Russian president had discussed the weapons handover plan with Obama at last week’s G-20 summit. Obama's case for limited airstrikes targeting Assad's regime was boosted early Tuesday when a Human Rights Watch report blamed Syrian government forces for the Aug. 21 poison gas attack that killed hundreds of people. The U.S.-based rights group said it had reached its conclusion after analyzing witness accounts, remnants of the weapons used and medical records of victims. Human Rights Watch report: Syrian government is likely responsible for chemical attack. HRW said it did not believe the attack could have been carried out by rebels or other “terrorists” as a smokescreen, as suggested by Assad. "Human Rights Watch and arms experts monitoring the use of weaponry in Syria have not documented Syrian opposition forces to be in possession of the 140mm and 330mm rockets used in the attack, or their associated launchers," the report added. Russia’s diplomatic solution appeared to be gathering momentum internationally -- as an attractive option for many U.S. allies who agree with the White House stance against chemical weapons but who are reluctant to be drawn into another Middle East military conflict. Sen. John McCain, R-Ariz., and Sen. Chuck Schumer, D-N.Y., are working with other senators on an alternative resolution to dealing with Syria and its chemical weapons. NBC News' Kasie Hunt reports. Russian Foreign Minister Sergei Lavrov explained his proposal during a pre-planned 14-minute phone call to John Kerry as the U.S. secretary of state flew from London to Washington Monday. U.S. officials said Kerry expressed concern that it would be hard to verify whether Syria had complied with any such plan, or to know if the regime had still kept some of its chemical weapons stockpiles. Adding to international concern, Turkey’s state-run Anadolu agency reported that Syrian jets bombed the border town of Tel Abyad on Monday, prompting yet more Syrians to seek refuge in Turkey. Thousands had already flooded across the border, leaving authorities struggling to cope. ..."
blogspots related to Morsy, even after his destitution by Egypt's military one year later. The Baghram attack on May 19, 2010, was accompanied by first news on secret negotiations between Taliban leaders and Afghan government envoys on the remote paradise of the Maldives. By the way, today's government request came from the same internet access point in Kabul as another request on August 17, 2013. That time's subject was chasing Al-Qaeda in Mali.